As a father of three girls, I struggle daily in determining what is healthy exposure to life’s realities and what is potentially dangerous to their growth as people and followers of Christ. My oldest is 14 and my youngest is six, this balancing act has to be handled differently for each one of my kids and that increases the challenge. I appreciate Wilson articulating so well what I had discovered and believed myself. The book I read by Wilson, wasn’t one of his dark stories but a collection of essays pertaining to living, dying, and story. 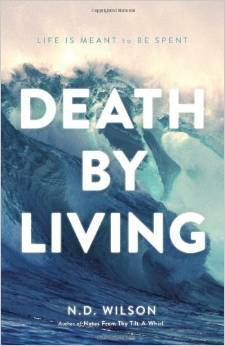 In Death by Living, Wilson is struck by the need to live life to a fullness that not only includes vast experiences and the obvious ups and downs but also leaves a legacy. He reflects on each one of his Grandparents with an admiration not just for their lives but for how their lives have shaped his own. Wilson seems to have a sense of awe, a holy reverence even, in his own story intermingled with that of his elder and late relatives. But like Frederick Buechner, who does something similar in The Eyes of the Heart, Wilson isn’t interested in creating neat devotional warm fuzzies about his Grandparents that reads more like an image from a Christmas postcard – all halcyon and sepia tones. He treats his subjects with admiration simply because they are a part of who he is and part of a plan that seems to be much bigger than even a good writer could conjure up. While Spufford used the reality of emotions to connect the reader with God, Wilson use the reality of story, our own story, to connect us with God. Samuel says in 1 Samuel 12 that “…be sure to fear the Lord and serve him faithfully with all your heart; consider what great things he has done for you.” The best way for us to consider what great things he has done for us is to remember our own stories and the stories of those which have infiltrated and influenced our own.